Screwing a faceplate directly to the back of the bowl blank creates some problems. It leaves holes in the back of your bowl, and it also limits how deeply you can cut into the face of the bowl without hitting screws. It’s better to use a dummy board and paper joint. The dummy board, simply a round wooden disc, can be cut from anything, even plywood scraps. Cut a disc slightly larger than the diameter of your faceplate and drive a brad through the center of the disc so that the brad tip projects about 1/8-in. out the back side. A paper joint allows the dummy board to be separated from the bowl later. Use paper that’s porous, like a grocery bag, or the glue won’t be able to soak in and hold. Using standard wood glue, glue the dummy board to the back of the bowl blank with the paper sandwiched in the middle. 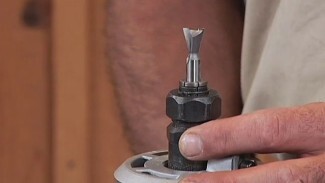 Use the tip of the nail to center the dummy board on a dimple you made in the center of the bowl blank. Clamp, and allow drying overnight. Cut the bowl blank round, tear off the excess paper, and pull the nail out of the dummy board. Center the faceplate over the hole left by the nail and use a scratch awl to create starter holes for the screws. Drive the screws. I like to use sheet metal screws for this because they have sharp, deep threads that bite into the dummy board. Use the largest diameter screw that will fit through the holes in your faceplate, making sure the screws are long enough to grab the dummy board, but not piercing the bowl blank. I recommend that first time turners use a round nose scraper for bowl work. They’re available in a variety of widths. A 1/2-in. wide scraper is pretty versatile. As your skills progress you can graduate to a bowl gouge. Don’t try to use spindle chisels for bowl work. They’re not designed for these types of cuts, and will most likely catch and tear. Position the tool rest so the top of the rest is slightly below the centerline of the bowl. 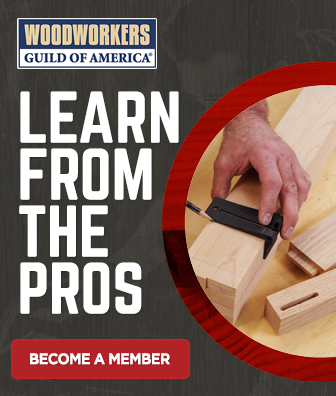 The tip of your chisel, when you lay it on the rest, should be even with the centerline. After setting the height, position the tool rest so it’s as close as it can be to the bowl, without rubbing on the bowl blank. The tool rest will need to be adjusted frequently to keep it in a safe position while you’re reducing the bowl’s diameter. Be certain that you follow lathe safety rules. Before running the lathe, check it’s set at the correct speed for the size of bowl you’re turning. Wear short sleeves or roll long sleeves up past your elbows. Remove any jewelry and wear a full face shield to protect your face. Some woods are more toxic than others and may require that you wear a dust mask while bowl turning. Lathe work consists of three steps: roughing, shaping, and sanding. Each step requires a different speed. The first step, roughing, is done to change the bowl blank from slightly eccentric to perfectly round. Hold the chisel with a light grip, parallel to the floor. 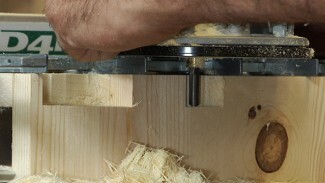 Allow your index finger to ride along the edge of the tool rest as you move it back and forth across the bowl exterior. Gently probe the chisel into the spinning bowl blank and, using light passes, remove small amounts of wood. You’ll notice a couple of slight stalls as I cut into this bowl blank a result of not having enough belt tension. Once the outside is round you can increase the speed slightly and begin shaping the bowl. On the outside, work from the bottom up toward the rim, cutting from small diameter to large. You should cut into the dummy board, shaping it slightly along with the bottom of the bowl. This makes it easier to separate the bowl and dummy board later. Frequently re-position the tool rest close to your work. After the outside shape is complete move the tool rest to hollow the inside. Begin hollowing by cutting in the center of the bowl, making a large dimple. Then make the dimple increasingly larger by working from the dimple’s rim to the bottom, cutting from large diameter to small. As you hollow the interior, re-position the tool rest so it projects inside the bowl as much as possible. As you hollow the interior, be careful you don’t leave the walls too thick or too thin, and that you don’t cut so deep that you go through the bottom of the bowl and into the dummy board. 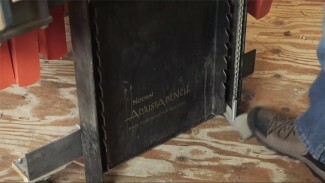 Bowl calipers can be used to measure the wall thickness. Stop the lathe when you do this. Tight-grained woods, like the maple shown here, will easily tolerate a wall thickness of 1/4-in., or even slightly less. A shop-made depth gauge makes it easy to measure to the bottom of the bowl to check the depth. Leave about 3/8-in. on the bottom of the bowl. Apply finish using a paper towel and protect the bed of the lathe from excess finish dripping on it. Stop the machine and begin saturating the bowl with finish. Keep the paper towel wet with finish and thoroughly coat the bowl. Then, with the machine running and the paper towel still damp, move the towel back and forth over the spinning bowl, polishing the interior and exterior. Allow the bowl the dry completely. 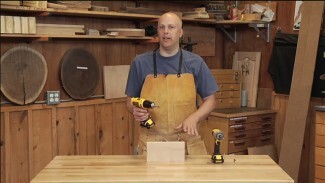 Remove the bowl from the dummy board by tapping a bench chisel into the paper joint. Protect the bowl by covering the bed of the lathe with a pad. Position the chisel so the flat of the chisel is against the bowl and the bevel is against the dummy board. Seat the tip of the chisel into the paper joint and gently tap the chisel with a mallet. Turn the bowl 90-degrees and do it again. Continue working around the paper joint until it separates on its own. Don’t be tempted to pull on the bowl or pry with the chisel. Once the paper joint has separated, you’ll find you have paper residue on the bowl bottom. Sand this off using a random orbit sander. Sign and date your bowl and apply the same finish you used on the rest of the bowl to the bottom.